This. Panthers fans have defended Cam vehemently from negative press and opinions but seem to be feasting on the same now that it's directed at Manziel. fug him, he's not a Panther. Not once in this entire article did it say that Manziel was struggling. Don't see the connection there. It's okay, little buddy. Don't hurt yourself. Was Cam relegated to 3rd string? I don't remember. Just asking. fyi, Bridgewater is thrown directly in the fire with the 1st team. Nope, he's still 3rd string, but he's getting 1st string reps because of how impressive he's been. “It’s just tough for him now being in, as we’ve already referred to it, his infant stages where he’s just trying to learn the book,” head coach Mike Pettine said. “It’s hard to even take reps."
Johnny's struggling with the Browns playbook. Sounds understandable until you realize that one of the reasons Bridgewater is getting 1st team reps in Minnesota is because he is doing so well with the playbook and the coaches have been impressed with how he knows the detail of every single players job and position on each of the plays. Sounds a lot like Teddy in college. Teddy is a smart guy, and I didn't really understand why his stock seemed to drop so far. No, I didn't think he was ready to start out of the gate, but the guy has tons of potential. I think the Peterson/Teddy/Patterson/Jennings offense would be pretty dangerous in the near future. He is the qb that scares me the most in this class. Manziel will be day one starter. People aren't going to pack that stadium or tune in on TV to see Hoyer. No matter the starter, that stadium will fill up well regardless. They have some of the best fans for sure. As for Manziel, it's WWAAYYY too early to cast a verdict on him. I'm not phased by the comments at all. The Vikings were very impressed with their first look at TeddyBridgewater in rookie camp. The quarterback threw with accuracy and zip, and most importantly he played with poise. It was especially evident in the blitz drills, as Bridgewater completed a high percentage of his throws against extra pass-rushers. It's gone past the point of just protecting Newton to proving that panther fans are actually just as dumb or dumber than the media that they despise. That may be in your nature but it's not in mine. 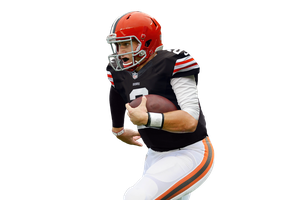 "Both scouts and coaches have told WalterFootball.com that they think Manziel could have some early success in the NFL. They think he could pull off some whacky plays and help lead his team to some points and wins, but over time they think his effectiveness could wane. Teams will start scheming to take away Manziel's strengths and force him to be a pocket passer [note NFL.com wrote: Manziel "struggled vs. LSU and Missouri when he was forced to stay inside the pocket."]. The hits will add up and he could land injuries or lose some ability to perform while playing injured. These sources feel his height and frame could hold him back in the long term. Manziel has to get better at his ability to throw from the pocket. ... he hasn't shown enough improvement in this regard..even when he had a great pocket to throw from. It will be critical for him to learn the ability to work quickly through his progressions and distribute the ball to the right receiver from the pocket. Becoming a consistently good pocket-passer will be the big hurdle for Manziel panning out." For a guy 'not a fan' of Manziel you certainly are a fan of Manziel. You sure do defend him a lot. Reading comprehension isn't exactly your strong suit, is it? What part of 'too soon to tell' is too complicated for you?